Positioning a nest box in your garden provides birds with a safe, sheltered place to breed and raise their family. When choosing a nest box, it’s a good idea to go for the best quality box that you can afford, as it is vital that nest box will not only look attractive, but also be a safe haven for young and vulnerable birds. 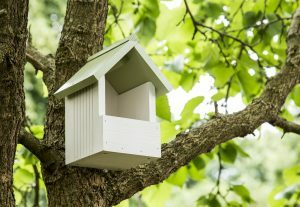 We recommend that you choose a nest box that has been made from a durable FSC timber and comes from a trusted bird manufacturer. It is important to use a nest box which its wood has not been coated in anything that may possibly hamper the development of young birds. Entrance holes are 32mm, the ideal size for all small-hole nesting birds, such as House Sparrows. It it is best to position nest boxes on tree trunks or on poles that are high up and well away from predators. Locate the nest box facing the direction between north and east to avoid and protect the birds and the nest box from the strongest sunlight, rain and wind.